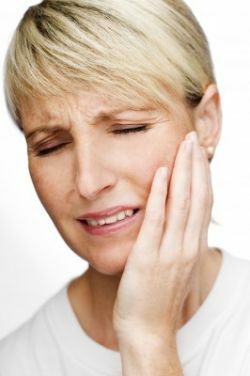 Tooth Pain Means Infection…but Where? With the oncoming season for cold and flu, it’s important to know how to identify tooth pain by distinguishing between gum or tooth infection vs. sinus infection. Tooth pain can be caused by a sinus infection or from an infection in the maxillary or upper row of teeth. Generally, if you have a sinus infection, you will feel pain in your upper row of teeth, throughout the jaw, cheeks and eyes. This pain is generated by Maxillary sinusitis which can be caused by allergy or bacteria. This type of sinus infection causes inflammation, building up pressure in the maxillary sinus. The pain is easily detected when chewing. If you have pain in more than one tooth in the upper row of teeth, this may indicate a sinus infection. This is also known as sinus toothache. Dental pain resulting from dental infection has different characteristics. Usually, dental pain is associated with gum disease, tooth cavity or need for root canal. If the pain is caused by hot and cold liquids, most likely this is reason to seek dental care immediately. Many times, with dental pain, the pain is primarily focused on one tooth, if it is a cavity, or resulting from the gum disease known as gingivitis. If you are experiencing tooth pain and have ruled out signs of sinus infection, call Ocean County dentist, Dr. Ron Rotem at your earliest convenience. Let the staff know that you are in pain, indicating the need for immediate treatment. Following a thorough and gentle exam, Dr. Rotem can diagnose your condition and evaluate proper treatment to alleviate your pain and care for the problem causing the pain. If Dr. Rotem finds no evidence of dental problems, he will advise you to seek an examination with your family physician. Your best defense against gum disease and dental problems is a daily practice of good oral hygiene. Good oral hygiene works in most cases, but if you do have the occasion to experience dental pain, remember to seek immediate professional dental care from Ocean County dentist, Dr. Ron Rotem.